Have you been to the Bullring Markets recently? Do you want lobster for that extra special meal? Fabric? Exotic fruit or everyday veg for the pot? 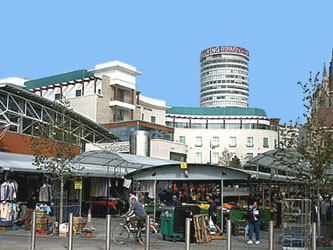 When mentioning Birmingham people often think of the Rotunda building, the Bullring shopping complex, and the Bullring markets. The retail and wholesale markets are situated right in Birmingham City Centre, and in an era of economic uncertainty offer excellent value and non pretentious trading for pretty much whatever floats your boat. Okay so it's not really a hidden gem, as it's often bustling! But it can be overlooked if you don't know it. Let me tell you about one of my favourite Birmingham past-times, exploring the Indoor, Open and Rag Markets for that weekend urban market mooch. The redeveloped Bullring Markets opened in 2000, and it is a mesmerising mix of individual retailers, for example, Caribbean staples, fresh fish and shellfish from an array of fishmongers and butchers open Monday - Saturday 9-5.30pm. Outside the more traditional Open Market is predominantly fresh produce on covered stalls. This skirts the Rag Market, a building which offers a mix of fabric/ clothing craft and old fashioned but useful haberdashery. It reminds me of lost but cherished 'Woolworths'; there's always something you didn't know you wanted. You need to be more organised to browse here as the opening times for these are 9-5pm every Tuesday, Thursday, Friday and Saturday. I enjoy immersing myself on a Saturday. Listening to the market trader banter selling their wares, watching a steady stream of Oriental locals choosing tiny live crabs, inspired by what they will concoct, all with an eye to filling my empty fridge and store cupboard. I can always find something and I'm sure you will too, pushing my Nigella Lawson buttons with whatever takes my fancy. Last week I returned home laden with bananas, mangoes, yogurts, fresh figs, limes, dressed crab and woody roots of fresh ginger, and it didn't break the bank. Good honest produce that would have cost a fortune in the supermarket. And at these prices I find I'm a bit more adventurous. I honestly had no idea what to do with a fresh fig; turns out they're pretty good in a salad with bacon and balsamic vinegar. So where are these Markets? Nestling around St Martin's Church at the back of the Bullring shopping centre, in the shadow of the silver discs of the iconic Selfridges store they are walkable from New Street and Snowhill train stations. I prefer to cycle, (be mindful it's a busy place, take a decent lock), or if driving park in the Bullring, Selfridges or the Market's own multi-story. Or go native and walk using postcode B5 4RQ for your smart-phone if you get lost in the metropolis. There are also regular Antiques markets in the Rag Market. And in the wholesale market area car boot pitches for the early Sunday riser, with the benefit of tarmac instead of grass. Think of it as a New York flea market vibe and you'll get a sense of the eclectic offerings! But please don't wake me as I am rarely a Sunday morning aficionado, maybe you are, give it a whirl! If you want to know more check out the official Birmingham website. 1. Take a few shopping bags. 2. Be mindful that you can carry all that you buy. Watermelons are heavy. 3. It's great for kids but it can be busy. 4. Go later in the day, after 4ish, for maybe a few extra bargains on fresh produce. Shhh. 5. For a small fee the Bullring hire out wheelchairs for the day (0121 616 2942).